One of the best things about the iPhone is its awesome camera – and the multitude of photography and camera apps that are available in the App Store. Even if it does not have the best credentials on paper, it’s arguably one of the best in the mobile phone world. Its megapixel count pales in comparison to its competitors, but with the autofocus, face detection, and its other features and capabilities more than make up for it. The iPhone 6s is armed with a powerful 12 megapixel camera capable of taking 4k (ultra high definition) videos. However, the hardware is just scratching the surface: there’s more to the camera than merely taking pictures, thanks to the apps. Due to Apple giving developers access to most of the camera’s features and capabilities, there are hundreds of them in the App Store. Some offer basic features you can find on others, while some have features which are unique to them. Anyway, if you’re looking for apps to help enhance your photography skills, take awesome cat pictures, and have a better experience with the iPhone camera, you’ve come to the right place. We tried out different camera apps and came up with a selection of the top three ones. Note: they’re awesome, and you should download them right away. Without further adieu, let’s check out what these are and know what they can do for you. This app has an Instagram-like vibe, which is partly the reason why it’s well-liked by many users. It’s basically an all-in-one app, armed with picture-taking, photo-editing, and online sharing capabilities. Be warned though: there is a little learning curve you will need to go through to in order to fully master the application. Regardless, once you get over it, everything will be intuitive. When you’re in camera mode, there’s a toolbar on top of the screen that allows you to change up the options and access basic camera functions like flash, exposure, and white balance. There’s even an option available if you want to place lines to help you take better pictures – including the rule of thirds. There is even an option to take a photo by tapping a large band at the bottom of the screen, instead of the traditional method involving a small circle and the volume + button on the default iPhone app. The main reason why it’s comparable to Instagram is mainly because of its multitude of filters. These are for free; you can get more through in-app purchases. Admittedly, the filters are good, but the downside is they are only known through names like B1, G3, and C1. You won’t know their effects until you actually try them out. The app’s photo editing features are a force to be reckoned with. It has 15 tools and with them, you can change the Temperature, Contrast, and Exposure. Simple tasks like cropping images is also included in the package. Apart from which, you can also add a bit of grain into your photo. 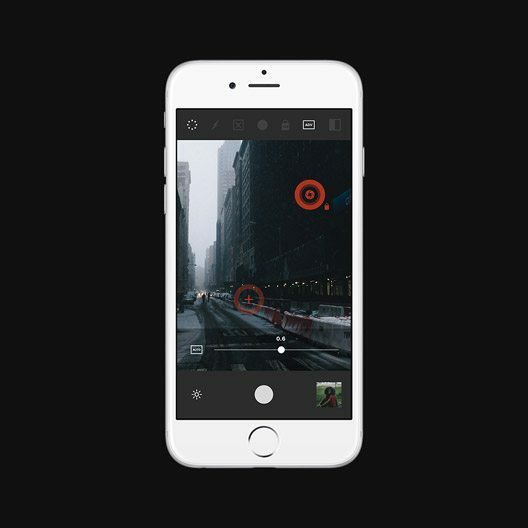 VSCO Cam has its own camera roll, and you can directly import the images on your iPhone into it if you need to access the photo editing feature. With that said, you can also change the settings to automatically put photos taken using VSCO Cam to to your iPhone’s camera roll. One of it’s notable features is allowing users to easily share their photos on the web – particularly on the top social networking websites: Facebook, Twitter, and Instagram. 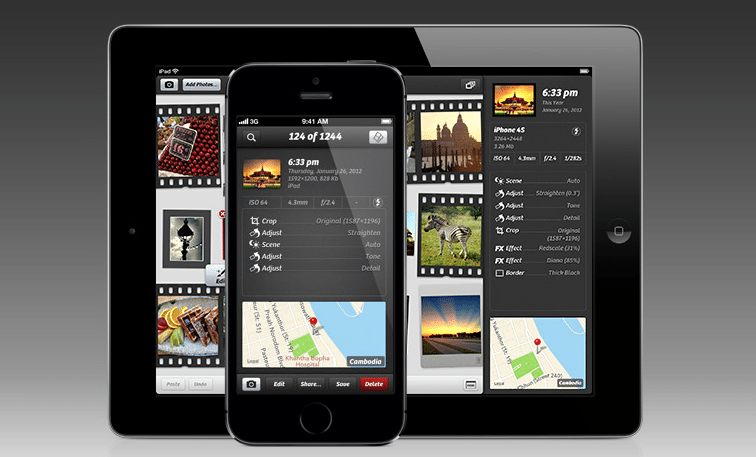 The app also has its own online photo gallery wherein the app’s users can share their photos for the world to see. It is aptly named the Grid. Be warned though: like Instagram, you can easily spend countless hours poring around beautiful photos taken by fellow VSCO Cam users. However, the downside is there is no social interaction. The photos that appear on the public Grid are curated, not liked or promoted by their owners. The names of the users who took the photos aren’t even displayed and they are not divided into categories. Sure, the curated photos are pretty good, but without social capacities and semblance of organization, the Grid is under-utilized and it will stay that way until the developers get their act together. Despite the bad online gallery setup, VCSO Cam remains as a great camera app with its cool features and editing capabilities. The filters are Instagram-like, but it could further improve if they are given names instead of ambiguous numbers and letters. Arguably one of the best camera apps available, Camera+ is multi-awarded and was named one of the 50 best iPhone apps by Time magazine in 2011. It has also been featured in publishing websites such as Wired and Wall Street Journal, so it has managed to rack up a good reputation. The app has sold for over 10 million times, so it’s crystal clear as to why it’s part of this list. We could even say that it’s currently the best in the business and it’s perfect whether you’re a seasoned photographer or an occasional hobbyist. Once you launch the app, you will be met with its strikingly familiar user interface: it looks similar to Apple in most aspects, making it intuitive and easy-to-use. These include the circular shutter at the bottom of the screen, buttons for flash and for switching cameras (front and back). The ISO and white balance options are displayed on-screen in a way that makes them stand out. Camera+ is armed with a stabilizer that helps you take the clearest and sharpest photos the iPhone can capture, while you can also use the Burst feature to take several consecutive photos in a short amount of time. It also has a front flash feature (introduced in 2012), which works by brightening the screen, something Apple picked up and included in the iPhone 6s. Right next to the shutter button, there’s the in-app settings button that you can use to customize the whole experience. For example, you can customize your workflow, toggle geotagging, and mute sound. You can also decide where the photos will be saved. There are also settings like Beach, Sunset, and Night to help you take photos that capture the scenes. Its editing capabilities awesome too – it contains all your basic photography needs, like filters, cropping photos, frames, and tints to beautify the photos you’ve captured. There are also cheap in-app purchases available if you want more filters! Though it does not have a Grid version, Camera+ allows you to share content directly to Twitter, Facebook, and Flickr. You can also send personal messages with attached photos directly from the app. The app also contains a number of effects, all designed to make your photo as aesthetically beautiful as possible. Among these include HDR and Grunge. Well, why not? The app is definitely well-made and should be your priority if you’re in the market for a new camera app. The user interface is intuitive and you wouldn’t need an instruction manual to learn how to use it. It’s also versatile and can give an experience similar to using a high-definition DSLR. Grayscale photos are timeless. Although today’s images are now dominated by photos well-endowed with color, black and white photos have a certain appeal that colored ones don’t have. It has a profound unexplainable impact on the eyes too, given that it conveys emotion effectively while leaving the colors to the viewer’s imagination. 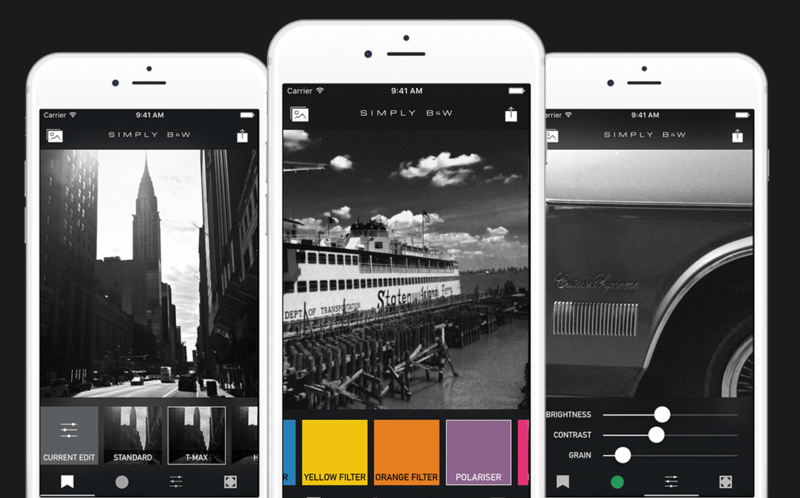 Unfortunately, SimplyB&W doesn’t have a camera mode, but is solely a photo editing app. Sure, it does not have filters, but its editing features are incredibly comprehensive and dedicated to creating the most beautiful grayscale photos. With that said, it does this by messing up with certain hues – for example, if there is a color red on the photo, the app can either lighten and darken it. Thankfully, there are set filters and templates ready if you have no idea how to manually adjust the photos and filters. You can also apply adjust the contrast, brightness, and grain of the image you’re editing. Apart from which, you can also apply a dark circular border on the photo to give out a vintage look. Though it brings fewer features to the table, it’s your go-to app if you’re fond of taking grayscale pictures. The black and white customization options are better and more comprehensive compared to Camera+ and VSCO Cam. It’s perfect if you have photos of historical places, monuments, and places of antiquity. It is also awesome for strong photos, especially those showing war, poverty, and life’s difficulties. Overall, these iPhone camera apps are a must-download if you want to have a better photo capture and editing experience with your device. Sure, the iPhone’s camera is already awesome in its own right, but it wouldn’t hurt to complement it with apps which can make it all better. Do you have other camera and photo editing app suggestions? Please tell us in the comments!